Not To just go off in another direction or nothing but did anyone but me show Wurmple some love? It's the first Pokemon since Eevee to evolve into different things... I'm pretty sure... Well except Tyrouge, but screw him. And Shedinja... Wonder Guard is Gold!!! If you use Blaziken with Double Kick he's really effective. You could definatley do the Elite Four with just him once you get him around level 75. I only use Overheat as his fire move and Double Kick with everything else. Rayquaza with Extremespeed and Fly and of course Salamence!!! Well all these options are good but Slaking, Salamence and Wobbuffet. Slaking's awesome Sp.atk and attack make a good physical sweeper. Salamence covers its flying type disadvantage with its dragon type(except the rock and ice weakness). Wobbuffet is a tank which has advantages(and disadvantages) owing to counter and mirror coat. Has anyone mentioned aggron? With a defense already skyrocketing, and some rv training on special defense and hp, the thing is a freaking wall. And it only has like 2 2x weaknesses. And a big group of "not very effective" types. Its also effin badass. Look at it! Except for the 4x weaknesses to Fighting and Ground, two of the more-common physical types in RSE. Even with the monster defense, it dies way too easily to Earthquake or Brick Break. Shedinja is good when you know the enemy can't harm it, but it's too big of a risk if there are many unknowns. 'The Best' is a bit objective, isn't it? Gardevoir, Blaziken, and Latias are all in my top five favorites list, and Blaziken is the first Uber starter class, at least by Smogon standards. Latios, paired with Politoed, carrying Draco Meteor, Surf, Thunder, and Roost, with a Life Orb is the best Hoenn original that I have ever used competitively, although I am no strategist, and have never strayed from the OU. Deoxys-A and Ninjask beat out all others in Attack and Speed, respectively, and Kyogre, Groudon, and Rayquaza are my favorite legendary theme trio. 'The Best' is all in the eye of the beholder. Pokemon is meant to be a means of interacting with other people, however. The way I see this, interaction means battling and trading. It seems to me, that out of all of the Hoenn pokemon, Rayquaza seems to be one of the most sought after pokemon in trades, not that I truly know this to be fact. Latios, on the other hand, always scares me a bit when I have to face it, to the point that I prioritized speed on my own Latios to counter them. I respect Latios. I am also wary of the many forms of Breloom, and the 'imaginary-non-mega' Blaziken. I do not really know of threats in other tiers, however, but in my eyes, although this may be a bit cliche and unoriginal, Latios is 'The Best Hoenn Pokemon'. Sentimentally speaking, however, both Gardevoir and Blaziken get strong shout outs from me, as well as Latios' little sister, Latias. …umm…sesha, you do know that Wobbuffet is a Johto original, right? To be honest, I liked Blaziken when Gen 3 came out, and i overall enjoyed using him. 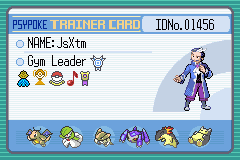 (I still use him in Black 2) But I thought the best was Skarmory, simply because it was a Flying type that could withstand an attack from Rock type. But then again, that's just me. Swampert was wonderful for me, and I also think Gardevoir is an extremely amazing Pokèmon. Skarmory is a Johto Pokemon, Hammer. It can withstand Rock type attacks due to it being Steel/Flying, not just Flying, and having a ridiculously high base defense stat. I'm a Blaziken man myself. He's got speed and power trade with almost any foe, my favorite type, FIYAH, and an overall awesome look(He's got some sweet pants).